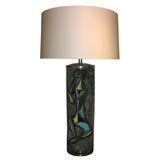 A ceramic table lamp signed Art Rumi Milano Italy decorated with abstract man New sockets and rewired shade not included. 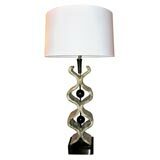 A table lamp signed Fantoni Italy ceramic with incised stylized Men iron base new sockets and rewired Shade not included. 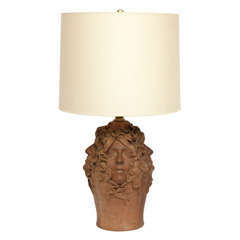 Mushroom shape Mid-Century Modern ceramic table lamp. This American made crackle ceramic lamp was typical of the 1950s style. Tall and simple, beautifully shaped. 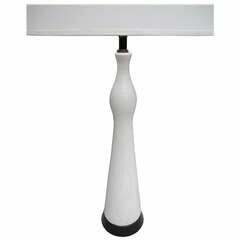 Pair of table lamps with white ceramic cone base topped by a steel corseted top. 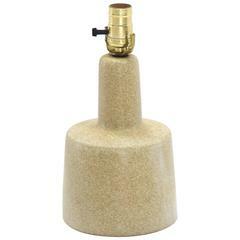 Lamp base measures 20" H.
Rare ceramic table lamp made in the Netherlands during the early 1960s. The lamp is in great condition without any cracks or chips. Measurements: H 26 x W 19 x D 19 cm.